Cross-country skiing first appeared at the 1976 Paralympic Winter Games in Örnsköldsvik, Sweden. The competition is open to athletes with a physical impairment and blindness/visual impairment. 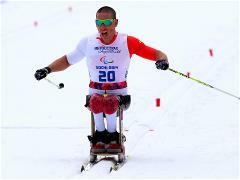 Depending on functional impairment, a competitor may use a sit-ski, a chair equipped with a pair of skis. Athletes with blindness/visual impairment compete in the event with a sighted guide. Male and female athletes compete in short distance, middle distance and long distance (ranging from 2.5km to 20km) or participate in a team relay using classical or free techniques. Cross-country Skiing is governed by the IPC with co-ordination by the IPC Nordic Skiing Technical Committee following modified rules of the International Ski Federation (FIS) and is practiced by athletes in 24 countries. Sit-Ski: Some athletes with a physical disability compete from a sitting position using a sit-ski, also called a mono-ski. As the name suggests, mono-skis have a specially fitted chair over a single ski. The chair includes seat belts and other strapping, as well as a suspension device to minimize wear and tear on the skier’s body. Ski: Made from fiberglass, classical skis are usually 25cm to 30cm taller than the height of a skier. They are light, weighing less than 0.45kg each; and narrow, with curved tips and a cambered midsection, which is thicker and arched. Free technique skis are about 10cm to 15cm shorter for greater maneuvering. They are also nominally stiffer and have tips that curve less than classical technique skis. The underside of both types of skis has a groove down the center to keep the ski straight when going downhill. The Lillehammer 1994 Paralympic Winter Games marked several other milestones in the history of Paralympic Nordic Skiing. Biathlon was introduced as a medal event for men and women, and for the first time Nordic skiers competed at the same venue used for the Olympic Winter Games. In the individual races, athletes compete in three categories: standing, sitting and visually impaired. In each class winners and prize-winners are defined. Athletes with blindness/visual impairment compete in the event with a sighted guide or "leader". The guide can be recognized by the yellow bib on top of the uniform. Some athletes with a physical disability compete from a sitting position using a sit-ski, also called a mono-ski. Mono-skis have a specially fitted chair over a single ski. The chair includes seat belts and other strapping, as well as a suspension device to minimize wear and tear on the skier's body.